7 May 2010, at 12:58a.m. 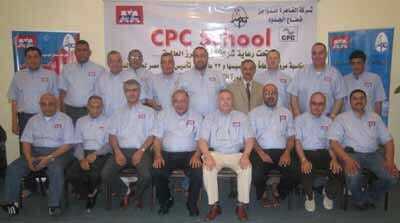 EGYPT - The Arbor Acres CPC School, an annual poultry training event held by Cairo Poultry Company (CPC) and sponsored by Aviagen, took place for the fourteenth time at the Red Sea resort of Hurghada from 27 February to 5 March 2010. CPC is the parent company of the Egyptian distributor of Arbor Acres birds, Misr Poultry Grandparents (MPG), and has developed the premier training event in the region. On behalf of Professor Nabil Darwish, the General Director of MPG, Eng. Atef Hassan, General Manager of MPG, opened the event by welcoming 25 young students to the school. He commented: "The Arbor Acres–CPC School is a fantastic platform for students in the poultry industry to further their knowledge and expertise. "MPG understands the importance to its customers of education, technical support and events such as this and we are fully committed to continuing that legacy." In addition to a number of local lecturers and experts from the Egyptian poultry industry, Stanley Millar, Arbor Acres Sales Manager for the region, updated the students on Arbor Acres activities throughout the Middle East and Africa. Aviagen's Regional Technical Manager, Puzant Dakessian, spoke to the audience on aspects of male management and this was followed by lectures on veterinary issues from Arbor Acres Regional veterinarian, Dr Akos Klausz. Lectures on nutrition and nutritional programmes for breeders were given by Professor Sayed Shalash, a nutritional consultant for CPC Group. Eng. Atef Abd Elmaguied and Dr Alla Abdou, the school director and facilitator for the event respectively, emphasised the important role of the Abor Acres-CPC School in adding to the education and expertise of young managers who are starting their career in the Egyptian poultry industry. Mr Dakessian commented: "Our involvement in the CPC School underlines Aviagen’s commitment to education and the training of new generations of poultry specialists. "This year's school was a huge success and we are hugely appreciative of the continued efforts made by MPG over the years to serve the cause of education and technical training. It is a shared goal and we will continue to meet the challenge together." Mr Millar also paid tribute to Professor Darwish, General Director of MPG: he and his team are the driving force behind the consistently growing popularity of the Arbor Acres brand within the Egyptian broiler industry, fulfilling the objective of Arbor Acres being the product of choice and MPG the supplier of choice.